Disclosure: The information and gift card have been provided by In The Raw® so that I could try the product and share my thoughts and information about In The Raw®. The opinions expressed in this post are my own and do not reflect the opinions of In The Raw®. The countdown is on! In just under one week we'll be watching another royal wedding take place. I do love a good wedding and can't wait to see all of the details of Prince Harry and Meghan's special day. Not only is it going to be a big day for the royal couple, May 19 will also be a big day for Jason and I as we will be celebrating our 15 year wedding anniversary. While I'm a bit miffed we weren't invited to the royal wedding, that doesn't mean that I can't host my own anniversary gathering that's fit for royalty, right? Whether you are a new bride or have been in the ring for a few years, one thing we can all agree on is a woman wants to look and feel her absolute best on her special day. I don't know what Meghan's secret is to always looking amazing, but my secret is swapping out sugar for zero-calorie sweetener In The Raw®. 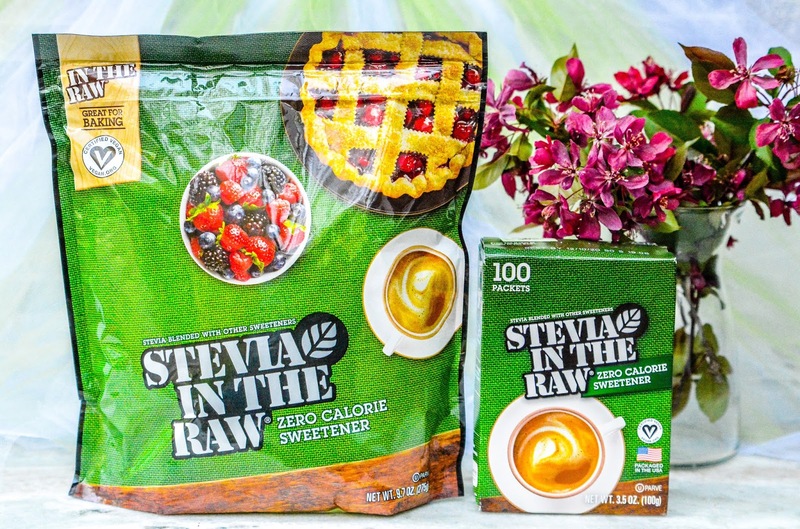 Stevia In The Raw® is perfect for all of your baking and cooking needs. One packet of In The Raw® is as sweet as 2 teaspoons of sugar but minus the calories so you don't have to sacrifice sweetness while cutting calories. 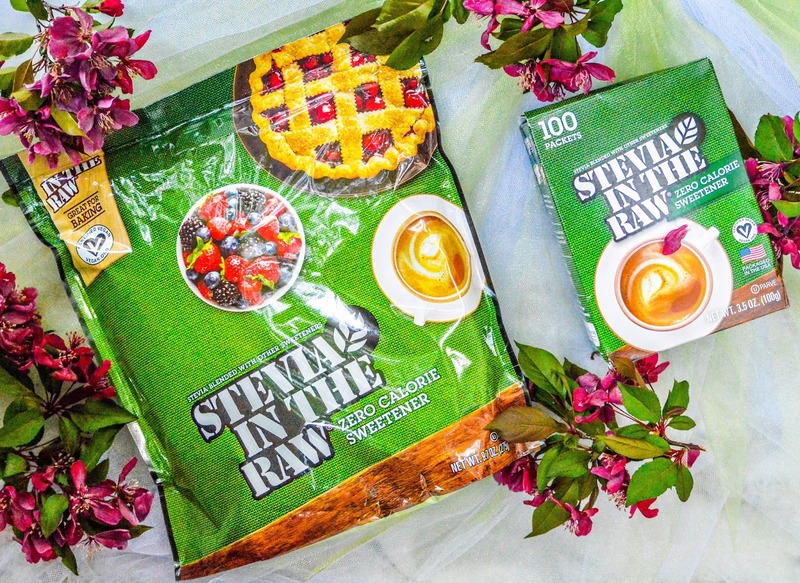 Stevia In The Raw® is available in convenient 1g packets or in a larger sized, user-friendly bakers bag. Because it measures cup for cup with sugar, it can be easily used in any baking recipe to reduce sugar and calorie intake without any conversion necessary. You can save up to 700 calories for every cup of sugar that is replaced with In The Raw®! I love browsing the In The Raw® recipe section of their website because I always find tempting treats that I don't mind indulging in. 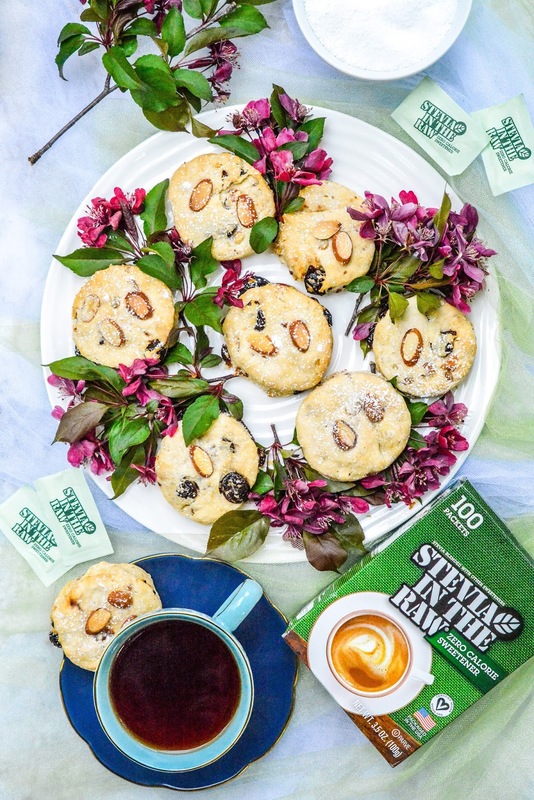 I recently grabbed this recipe for Cherry Almond Scones because scones always feel British to me and I thought they'd make a lovely treat to snack on while watching the royal wedding unfold. These little cakes are filled with the flavors that I adore and would look beautiful on any reception table. Biscuit sized pastries go hand in hand with a hot cup of tea, even the queen would approve, I'm sure. If you have a Costco nearby, I recommend using their Tart Montgomery Cherries with your baking. They are huge and juicy and don't dry out in your baked good recipes. Preheat oven to 425℉. Line a large baking sheet with parchment. Place cherries in a small bowl. In a small saucepan bring 1 cup water to a boil. Remove from heat, place tea bags in water, and steep for 10 minutes. Discard tea bags and pour brewed tea over cherries. Let sit until completely cooled, about 30 minutes. Drain cherries and pat dry. Set aside. In a medium bowl whisk together flour, Stevia In The Raw®, baking powder, and salt. Stir in ½ cup almonds. In a second small bowl whisk together cream, egg, orange zest, vanilla, and almond extract. Stir cream mixture and cherries into flour mixture, mixing gently until flour is moistened and dough holds together. Transfer dough to counter top and shape into a ¾” thick round. Use a 2” round cutter to cut out dough. 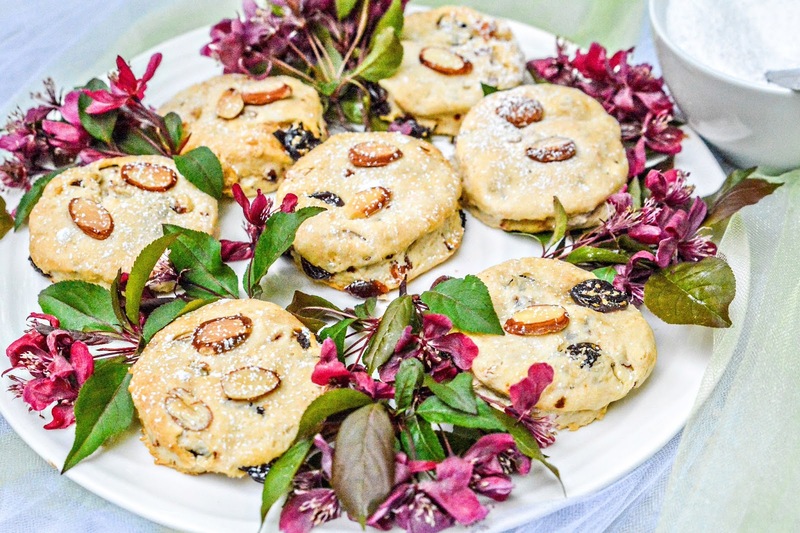 Place scones on baking sheet, brush with butter, and sprinkle with remaining ¼ cup almonds, pressing almonds down gently. Bake until risen and golden brown, about 20 minutes. Cool briefly on pan. Dust scones lightly with powdered sugar. If you are out and about, the In The Raw® packets are handy to tuck into your purse or car console so you have sweetener on hand at all times. 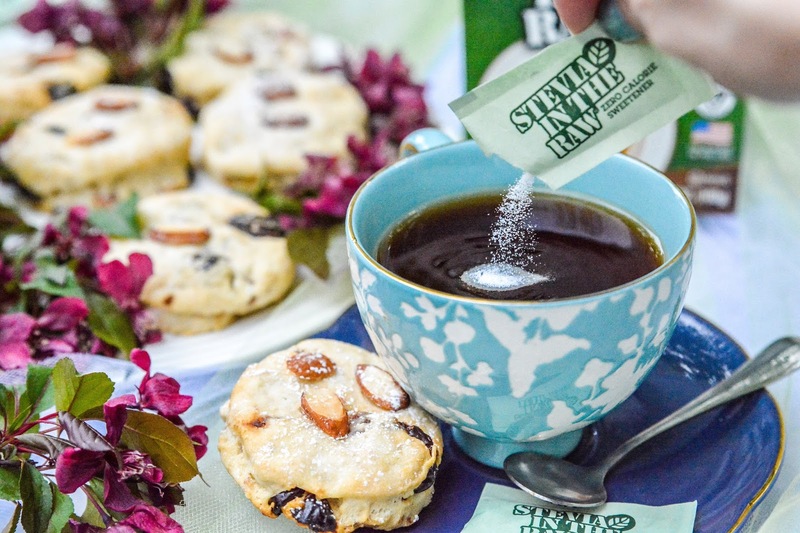 If you find yourself invited out to tea and scones, you won't have to worry about sipping on unsweetened or sugar filled tea when you have your In The Raw® packets within reach. In addition to my own anniversary shindigs this weekend, we'll also be wishing the young royal couple a lifetime of love and happiness during their nuptials. I hope they are always as lucky in love as Jason and I have been all of these years. You can find In The Raw® products at most food retailers nationwide. Be sure to check out In The Raw® website for additional recipes. What is your favorite recipe to use with In The Raw®? Oh my goodness these sound absolutely delicious! I would most definitely LOVE to give one of these a try I bet these taste amazing, perfect for watching the wedding with ;). Those scones look so good they could be at the royal wedding. I rarely bake but this is a recipe i would love to try before the wedding. Those scones look amazing. I've been a huge fan of scones for years, and I'm always on the lookout for new recipes. Oh wow those look just delicious!!! My husband has been wanting to switch to Stevia. A swap can sure do the trick to help with many an ailments and aging. Royal wedding though. Pfffffft. Congrats on almost 15 years. Your scones and the presentation should be part of the royal reception! They look fit for any royalty! It's cherry season, and I couldn't be more thrilled! These scones look and sound fantastic. Definitely perfect for a very early breakfast with my best friends while watching coverage of the royal wedding. Wow these look so delicious. I always use this sugar in our home too! I've never made scones! It sounds like a great recipe! Can't wait to make it! Cherries and almonds together are delicious! Your scones look so mouth watering! I don't bake often because more often than not, my baked "goodies" are not that pretty to look at. I'm not giving up though. I will try your recipe and hopefully it would turn out as pretty as you made them. This looks really good! I would love to try this! Being diabetic, I get my sweet fix using Stevia. It is the only sweetener that my endocrinologist approves for me to use. I like that they have single serve sachets that I can take with me anywhere. Thanks for the recipe for the cherry almond scones too. They look so yummy! 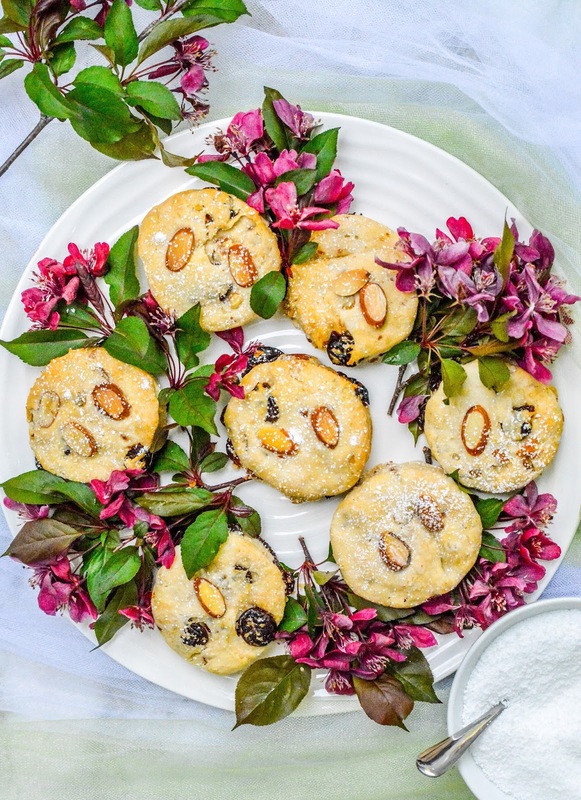 Those scones and the flowers! They look soooo beautiful, Theresa. I do use stevia at home and the office. really helpful!